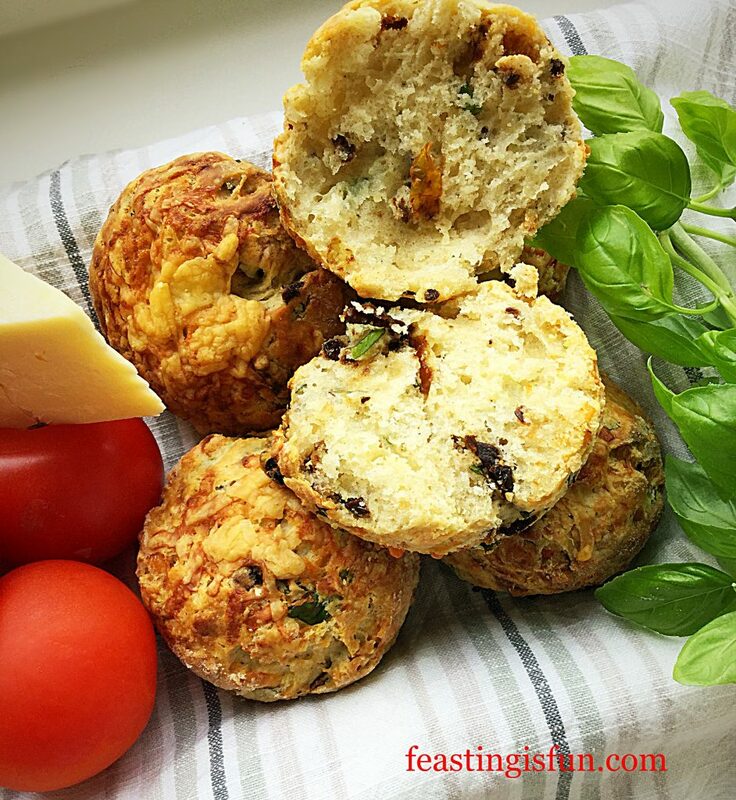 Cheddar Sun Dried Tomato Scones are the best savoury scones made at Feasting headquarters so far. Sharp, mature cheddar pairs beautifully with the sun dried tomatoes and the addition of fresh basil completes the final flavour. These scones need no addition as they are moist and light. Two things are really important when making these scones. First of all, use great ingredients. That doesn’t mean everything has to be top of the range, but buy the best mature cheddar you can afford. While the final flavour is not overpowering, using a mild cheddar results in a bland tasting scone. Also keeping your hands light, while making the scone dough will result in a light scone. Because if you work the dough too much the baked scones will be heavy. 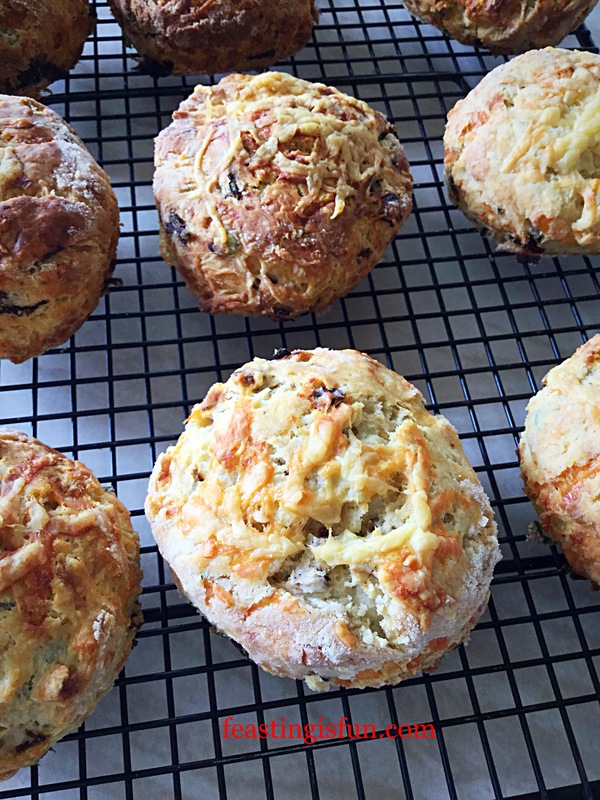 Cheddar Sun Dried Tomato Scones it’s hard to stop at one! Since the sun dried tomatoes add a depth of savoury flavour to the finished scone, they are crucial to the recipe. Dry packaged are best, however if they are only available in oil that’s okay. Simply remove slightly more than the recipe calls for and drain them thoroughly using kitchen towels. While their deep, unique flavour and texture will still work in this recipe. 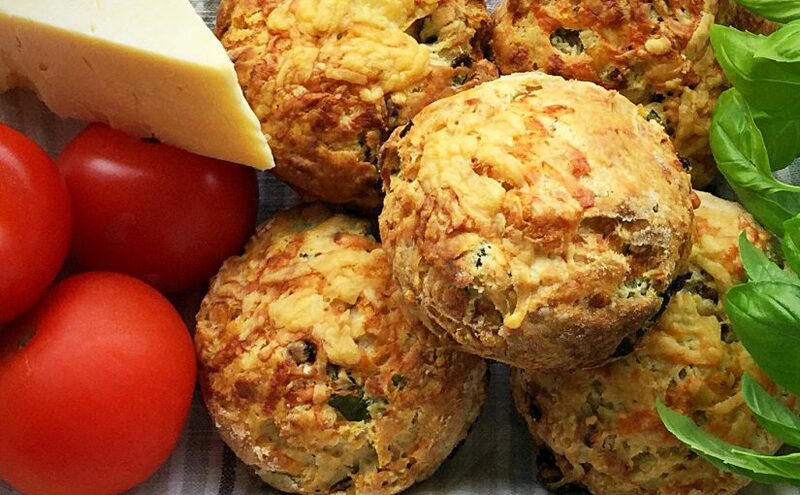 Cheddar Sun Dried Tomato Scones the cheese melts into the scone, yet the basil and tomatoes are still visible. Handful of Fresh Basil Leaves – approx. 10 large leaves. You will need two large baking trays lined with baking parchment and a 5cm/2″ plain round cutter. First of all prepare the ingredients. Grate the cheese and chop, or snip the sun dried tomatoes and basil into similar sized pieces – see photo. Add your flour, baking powder, salt and a good grinding of black pepper to a large bowl. Use a balloon whisk to blend the ingredients together. Next add both the fats and blend them into the flour using a pastry cutter. Alternatively rub the fat into the flour using your fingers. Finally the flour should have a breadcrumb appearance with some larger, pea sized, pieces of fat visible. Add one third of the grated cheese to the bowl. 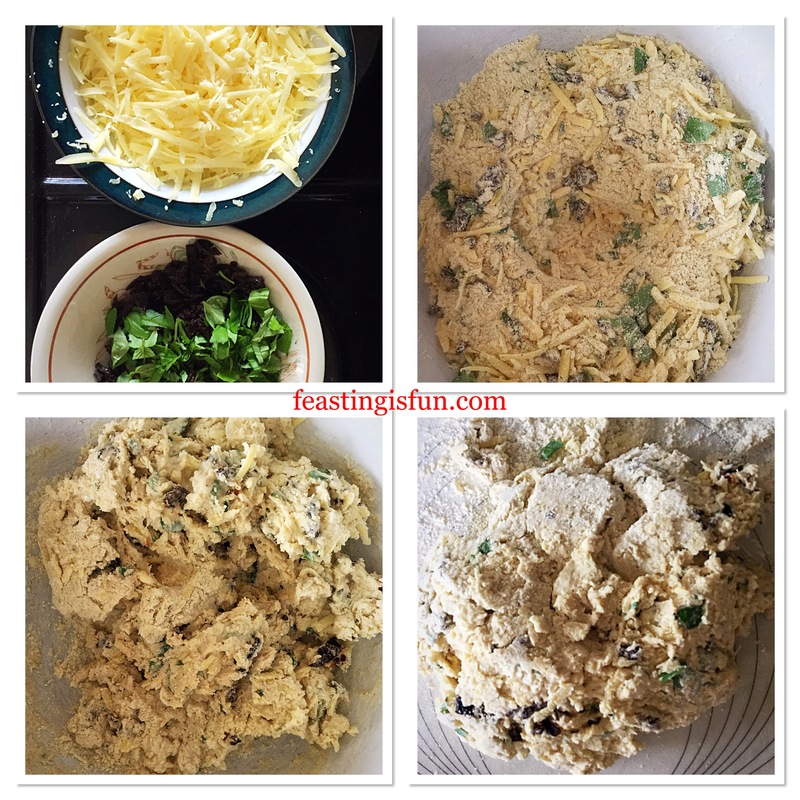 Use your fingers to toss the cheese in the flour. This coats the cheese and stops it from clumping. Repeat with half of the remaining cheese. Set the unused cheese to one side. Now do the same with the sun dried tomatoes and fresh basil, tossing them in the flour to coat them. Make a well in the centre of the bowl and pour in the cold milk. Stir the ingredients together with a dinner knife, until they form a rough dough. Use your hand, shaped like a claw to pull all the ingredients together. Tip the scone dough on to a lightly floured work top. 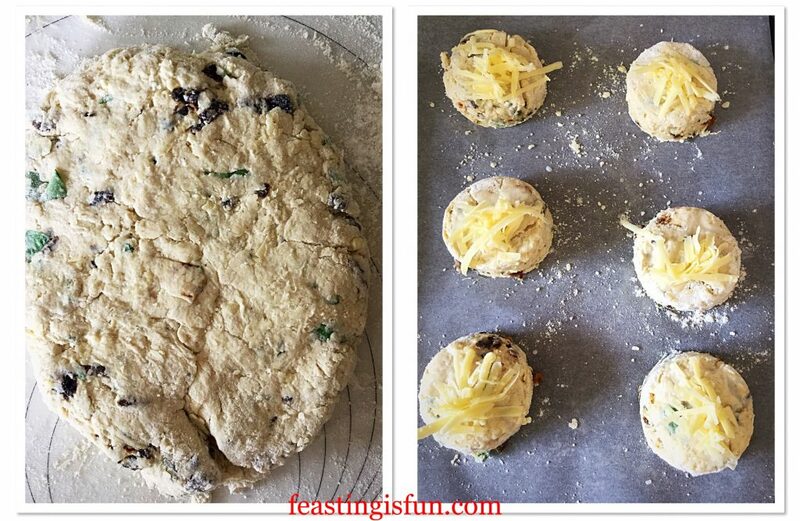 Making the Cheddar Sun Dried Tomato Scones dough. Bring the dough together with your hands and pat into a rough circle approximately 1 inch/2.5cm deep. Thoroughly flour the round cutter and cut out the scones. NOTE: Do not twist the cutter as you push through the dough as this will result in uneven/lopsided final bakes. Place the scones on to the lined baking trays. 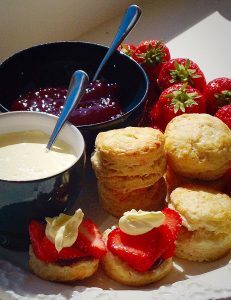 Brush the top of each scone with milk and add a little of the remaining cheese. Shaping the dough and cutting out the scones. Place the baking trays into the preheated oven and bake for 20-25 minutes. 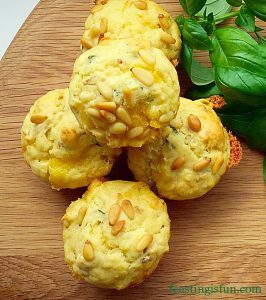 The scones are baked when they are a golden colour and similar to bread sound hollow when rapped on the base with a knuckle. As soon as they are baked remove the scones from the oven. Immediately place the scones on to a cooling rack, using a clean tea towel to transfer them as they will be very hot. Cheddar Sun Dried Tomato Scones cooling on a rack. Since these scones are at their absolute best when still slightly warm, there is no need to wait for them to completely cool before tasting! 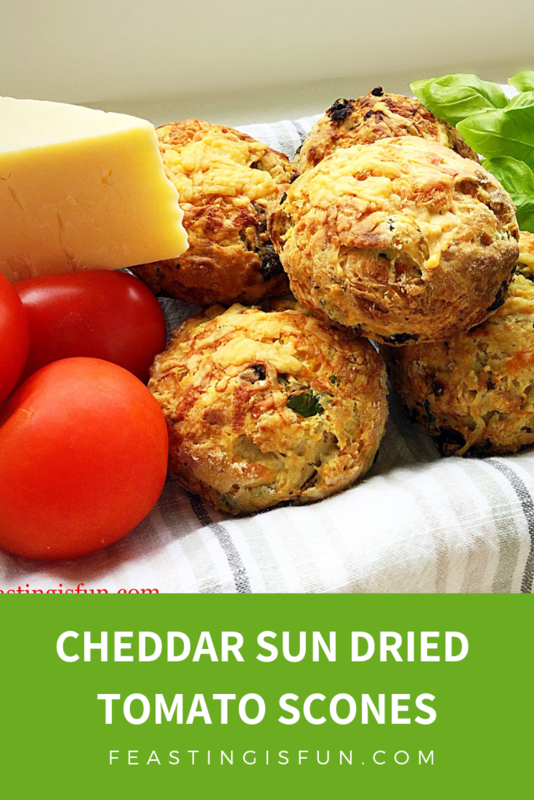 Cheddar Sun Dried Tomato Scones delicious split with a little butter! While delicious eaten warm, cool completely before packing into an airtight container to store. Also the scones can be made ahead, cooled and packed into freezer bags. They will keep for up to one month in the deep freeze. Ideal for making ahead. 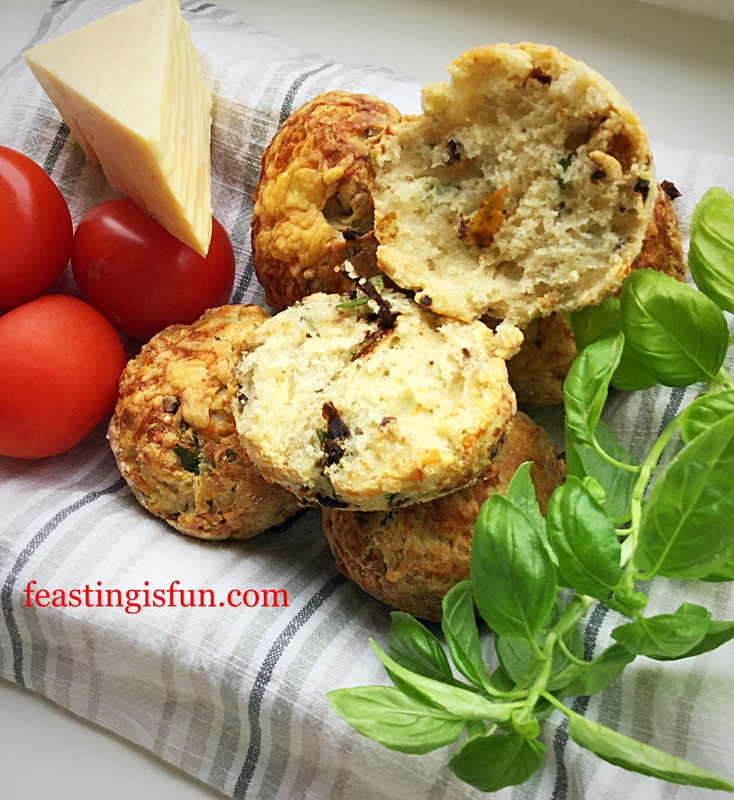 Cheddar Sun Dried Tomato Scones, such a delicious combination of flavours and texture. Also perfect for making ahead and freezing, ready to pop in the oven on a low heat when unexpected guests arrive. Make ahead recipes are my all time favourites. Especially as I never know from one day to the next how my body will be. Fortunately it’s always nice to know that there is good, homemade food in the house. 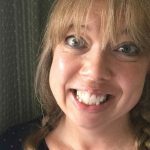 No part of this post may be copied. Please see my Disclosure Policy. 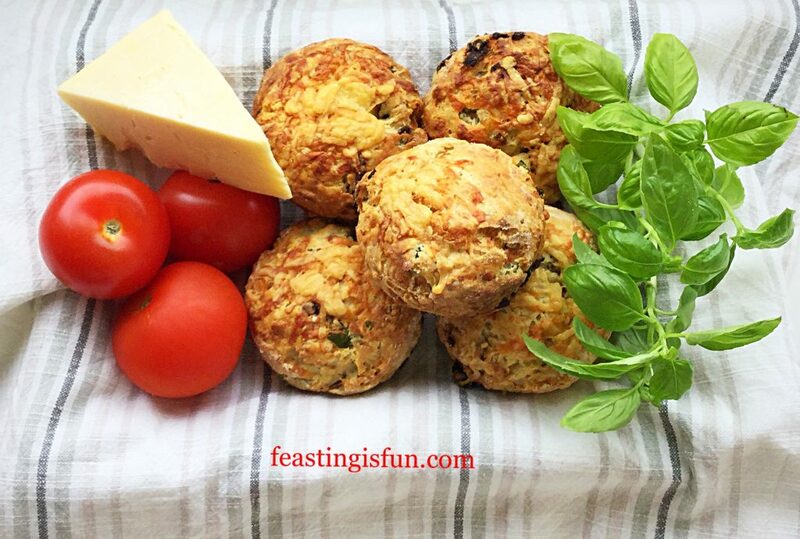 These look so yummy, I agree that using strong cheddar gives the best flavour! 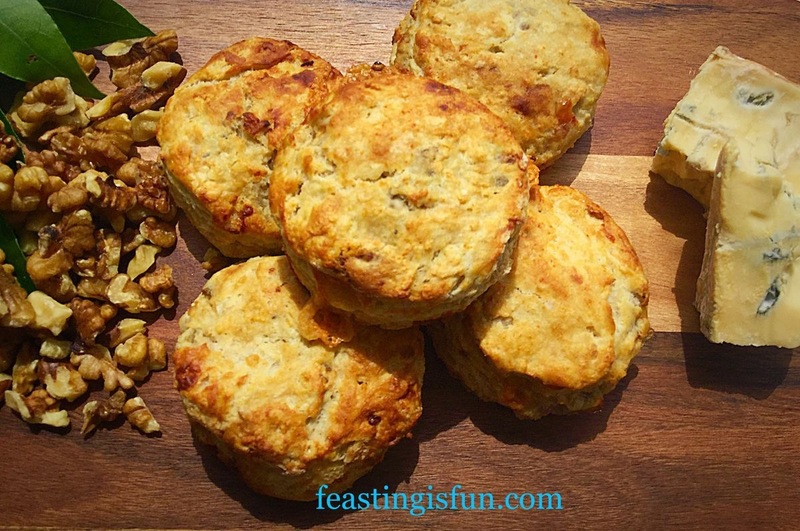 A cheesy scone sounds so good! Love it. Any strong cheddar is fine by me, that’s for sure. These look like an ideal gift to give at Christmas; I shall have to make these! Ah thank you. These delicious Scones really do take moments to make and not long to bake. They have become a household favourite.